LE HOUNFOR DE LA VODOBOX /  How to convert a movie into a video stream with adaptive bitrate support ? 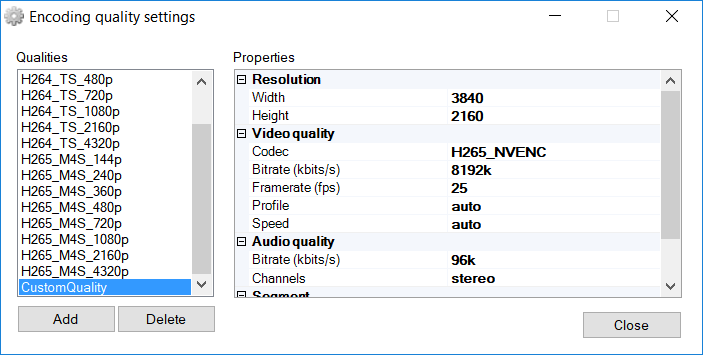 »  How to convert a movie into a video stream with adaptive bitrate support ? How to convert a movie into a video stream with adaptive bitrate support ? This tutorial explains how to install and setup the VODOBOX HLS Encoder program on a Windows operating system to convert a video file into an HLS video stream supporting adaptive bitrate. Install the VODOBOX HLS Encoder program on your operating system using its Windows installer (.exe file) or archive (.zip file). Double-click the downloaded file and follow the Windows wizard instructions. At the first application start, copy and paste your activation key received by email and accept the software license terms. Unzip the downloaded file by right-clicking it, and choose Extract All. 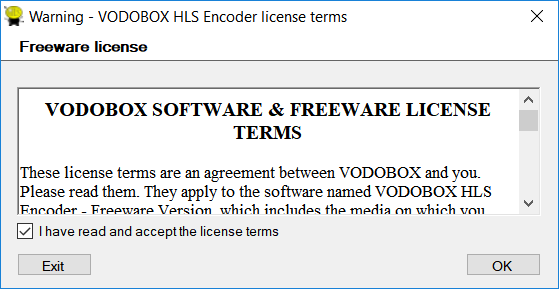 Then in the new folder where you unpacked the VODOBOX HLS Encoder program, double-click on the VDB_HLSEnc.exe file, copy and paste your activation key received by email and accept the software license terms. In the File path field of the Video file source section, specify the source path of the video file you are considering to convert into HLS video stream. If your video file contains some alternatives audio and/or subtitle tracks (like additional languages, video descriptions, etc), tick the audio streams and/or subtitle streams options to keep them available in your HLS video stream. 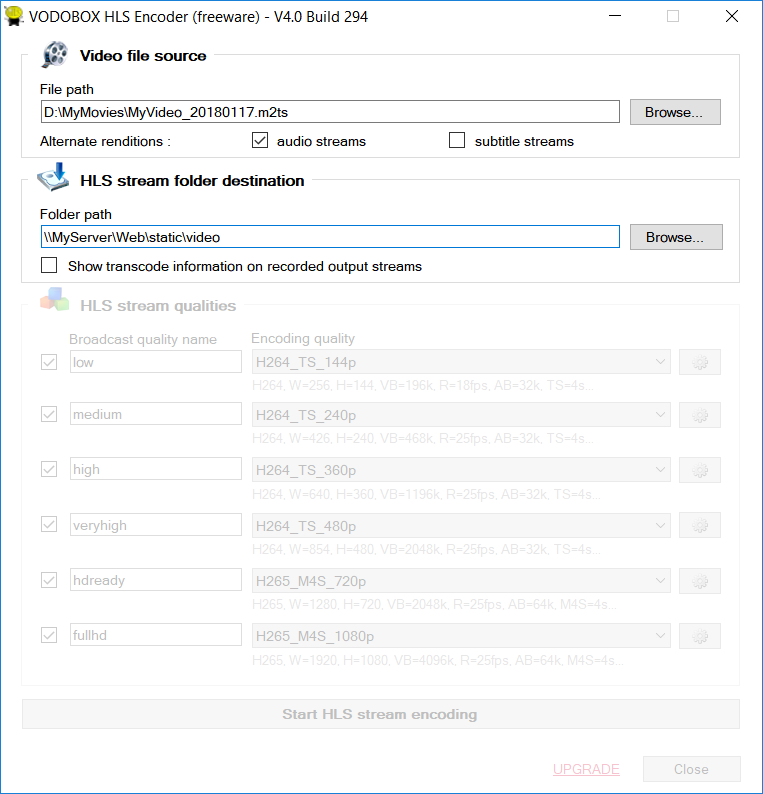 In the Folder path field of the HLS stream folder destination section, specify the output folder path where you are considering to export your HLS video stream. 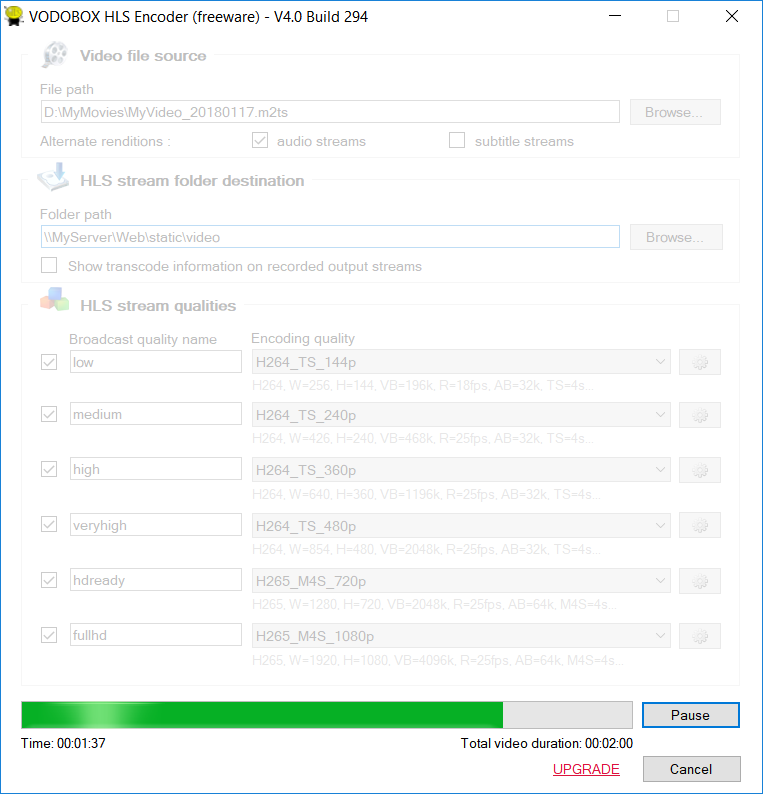 Tick the Show transcode information on recorded output streams option to create an HLS demo stream and check your video player supports the adaptive bitrate streaming properly. In the HLS stream qualities section, tick up to 6 broadcasts qualities. Each broadcast quality ticked will be encoded and embedded in the HLS video stream created.
. choose in the Encoding quality field, the compression quality to use with this broadcast quality. To make your HLS video stream visible by all your spectators, think to include a low compression quality with a small resolution for mobile devices watching through a slow Internet connection. All others devices with efficient Internet connections will be able to benefit standard and superior video qualities built in your HLS video stream. Experimented users can create and/or modify settings of the encoding qualities to adapt them to their production needs. In the HLS stream qualities section, click the button with a gray gear on the right of the Encoding quality field to open the Encoding quality settings panel.
. click on the Close button to save your settings. For Width and Height settings in the Properties grid, you can use the * character to signify this value is auto-calculated depending the reference size you chose to fix. The picture ratio of your HLS video stream will be the same of the video source file, so it doesn't matter if its ratio isn't normalized. You can't modify or alter the encoding qualities presets of the VODOBOX HLS Encoder program, but you can duplicate them as new and put your own settings. The encoding qualities presets carrying the H264_ prefix guarantee you an optimum quality and compression ratio, in accordance with Apple's best practices for deploying video media. PS/ Video codecs suffixed by _NVENC or _QSYNC support the hardware acceleration of NVidia graphics chips which are compliant with NVEnc technology instead of the main processor of your streaming server, or with the graphic accelerator Quick Sync Video of your main Intel processor. Each broadcast quality consumes a GPU encoding thread. Refer to the documentation for your NVidia graphic card or your Intel processor to know how many simultaneous encoding GPU threads your hardware accelerator can support (ex: graphics cards from the GeForce family are two simultaneous threads limited, it's equal to 2 encoding qualities per Windows server). Click on the Start HLS stream encoding button to convert your video source file into HLS video stream. The more you embed broadcasting qualities in your HLS video stream, the more encoding time will be long. Audio and video compression algorithms can employ all the resources available on your computer station, so you can use the Pause/Resume button to suspend/restart the video file treatment. The thumbnail displays a snapshot of your movie in your video player. Click on the << and >> buttons to choose your favorite thumbnail and/or click on the more... button to get new thumbnails. The picture displayed at the top of the window will be the final thumbnail illustrating your movie. 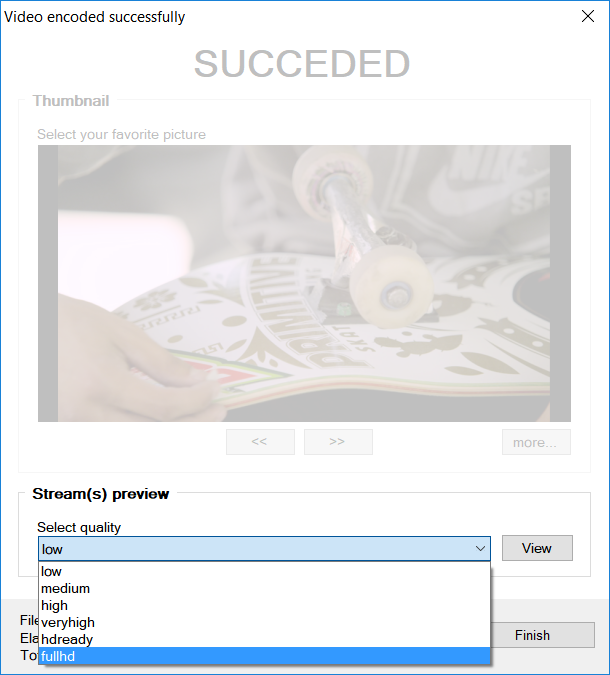 In the Select quality field, choose a broadcast quality embed in your HLS video stream, then click the View button to watch the final result. Repeat this step for each broadcast quality you would validate. Click on the Finish button to finalize your HLS video stream creation process. 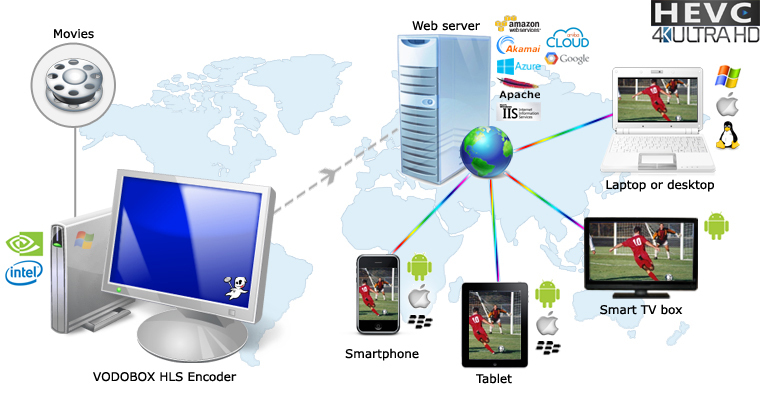 Your HLS video stream is watchable through many kind of devices : computers, smartphones, tablets, smart TV boxes, etc. 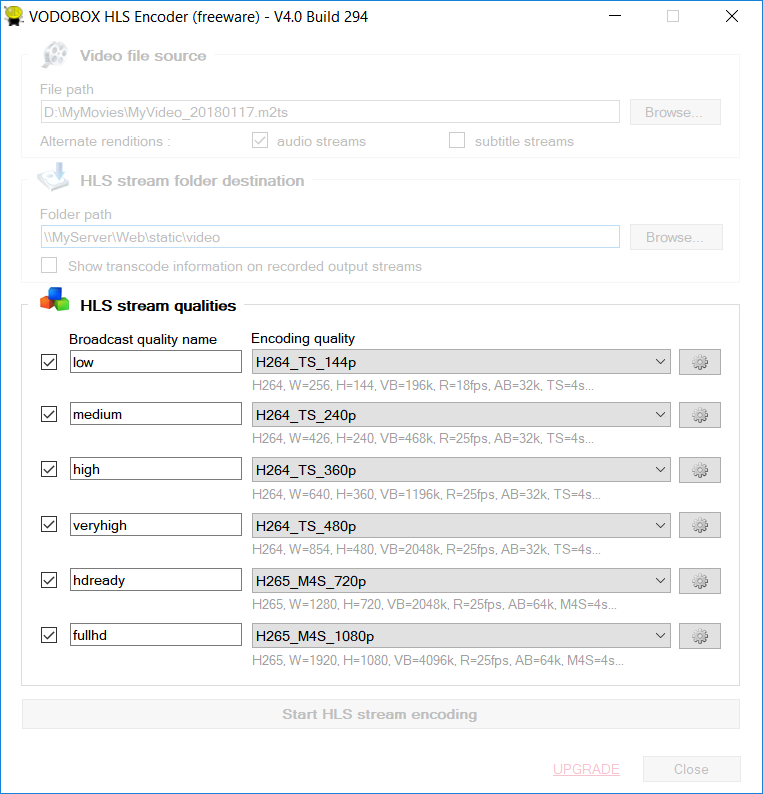 Get your HLS video stream in the export folder you defined in step 1 of this tutorial and copy it entirely on your Web server (Apache, IIS) or on your Cloud storage (Amazon S3, Microsoft Azure Storage, Google Cloud Storage, etc). The master file of your HLS video stream is at the root of your HLS video stream folder. It has a .m3u8 extension. This master file can be read by any HLS video player. If you ticked options to keep alternate audio or subtitle tracks of your video file in your HLS video stream, you can find another master file having the _alternate.m3u8 suffix. Your HLS video player must support alternate media renditions to be able to read this second master file. Contact your HLS video player provider to know how to enable this feature in your video player. > How to convert many video files into HLS video stream with the same process ? You can execute the VODOBOX HLS Encoder program through a command prompt. So you can call it from an MS-DOS script or from any others applications you developed. ex: VDB_HLSEnc.exe /I="C:\MyVideoLibrary\MyMovie.mp4" /O="D:\Web" /S1=low;H264_TS_144p /S2=medium;H264_TS_240p /S3=high;H264_TS_360p /S4=veryhigh;H264_TS_480p /S5=hdready;H264_TS_720p /S6=fullhd;H264_TS_1080p /D="C:\Diary.log"